I won’t go as far as to call these “the best ever” buttermilk pancakes or to say “this is the only pancake recipe you’ll ever need”. However, I will very confidently call these our family favorite buttermilk pancakes. We have tried many, many recipes and mixes over the years but we always come back to this one. 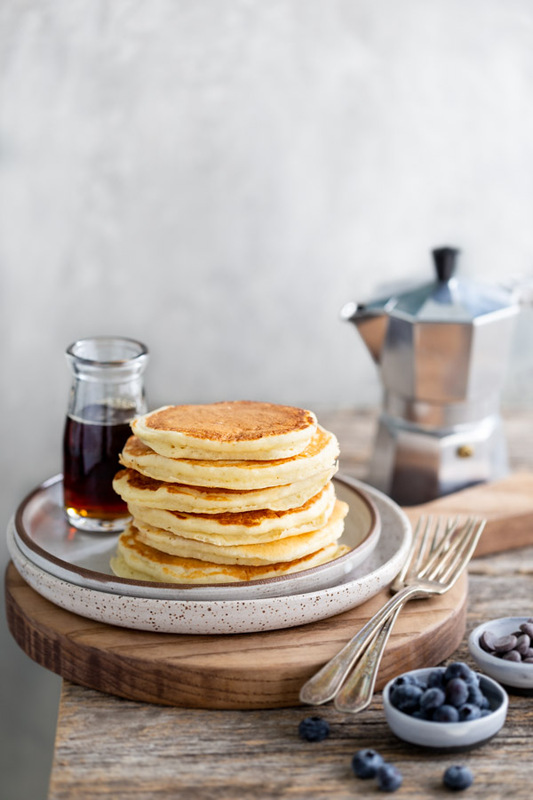 These pancakes are light and fluffy and easy enough to whip up on a weekday morning. I can easily double or triple the recipe and I almost always have all the ingredients on hand. So, for me, these pancakes are perfect. My skillet of choice for making pancakes is a large, heavy non-stick skillet. Some people swear by cast iron skillets or griddles. Although I’m usually a huge fan of cast-iron, I find that I can never control the heat as much as I would like when making pancakes in my cast-iron skillet and I have to use a lot more butter to keep the pancakes from sticking. 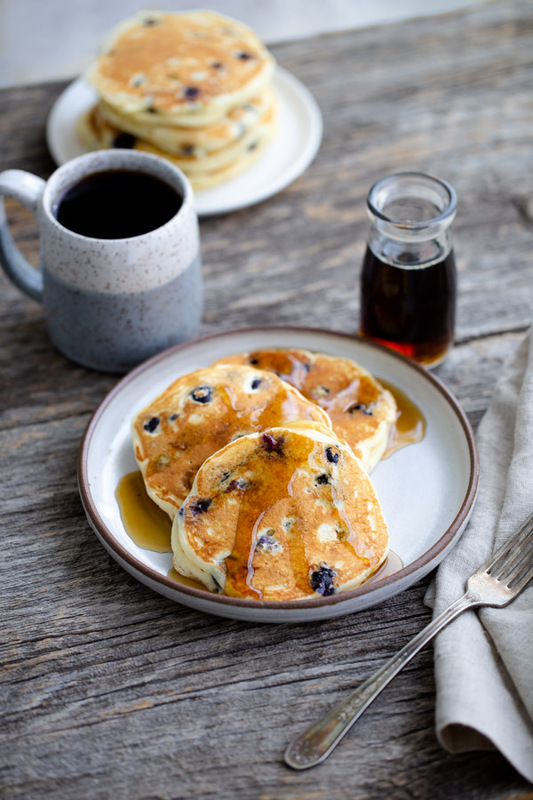 Although these are delicious plain, our favorite buttermilk pancakes get blueberries (my husband’s first choice) or chocolate chips (the kids’ favorite) added in. I usually end up making some of each so everyone’s happy. Whether you choose to add in blueberries, chocolate chips or nothing at all, don’t over mix the batter. The less you mix, the lighter your pancakes will be. Having small to medium lumps in the batter is perfectly fine. I mix until I no longer see large dry flecks of flour. Then drizzle on some maple syrup (the real stuff only, please) and get your day started right. In a medium bowl, whisk together dry ingredients until evenly mixed. Set aside. In another medium bowl, whisk together the buttermilk, milk, egg, and melted butter. Pour the wet ingredients into the dry ingredients and whisk together until just mixed. There will be lumps in the batter which is perfectly fine. Don’t over mix. Heat a heavy non-stick skillet over medium-high heat until hot (To test it, flick a little water into the pan. The water should skitter across the surface.) Lightly coat the skillet with non-stick cooking spray or butter. 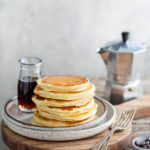 Working in batches, for each pancake, pour a scant ¼ cup of the batter into the skillet and cook until bubbles form on the surface, the edges are a little dry and the underside is nicely browned, 2-3 minutes. Flip the pancakes and cook until the bottoms are browned, 1 to 2 minutes more. For our family of 4, I usually double the recipe. For blueberry or chocolate chip pancakes, gently fold 2 cups blueberries or 1 1/2 cups chocolate chips into the batter before cooking.